Digg has become synonymous with “social news”, but there are a number of other sites with similar concepts out there, many of them with their sights set on trying to remove Digg from the throne. We have looked at the traffic trends for 10 different social news sites to get an idea of how it is going for Digg and its competitors. We included Digg, StumbleUpon, Slashdot, Reddit, Mixx, Propeller, Newsvine, Fark, Dzone and Sphinn. Unfortunately we were not able to include Yahoo’s new entry in the field, Yahoo Buzz. It is located on a subdomain of Yahoo.com (buzz.yahoo.com) and Google Trends for Websites, the tool we used to get traffic data, is unable to distinguish this from traffic to Yahoo.com. Traffic-wise, Digg.com stands heads and shoulders above the other sites in this survey, but they seem to have reached a plateau. They have roughly the same number of visitors now compared to a year ago. Mixx.com has the most aggressive growth curve. Propeller.com (previously hosted on the Netscape.com domain) is also growing fast, doubling its traffic in the last year. Slashdot.org (the original) is losing visitors. They have roughly 25% less visitors now compared to a year ago. It might be worth noting that StumbleUpon is a bit of a special case in this survey, since their users interact mostly with the StumbleUpon browser toolbar and not so much directly with the website. As we pointed out above, traffic to Digg seems to have reached a plateau. This lack of growth (at least based on the traffic numbers from Google) leaves room for others to catch up, even though it should be pointed out that they still have a strong lead. Mixx is growing the fastest (scroll down to see their traffic graph), though their number of daily visitors is still modest compared to the biggest players. These are approximations based on the graphs from Google Trends for Websites. Within parenthesis we have indicated if the traffic has been increasing or decreasing over the last year, or if there is no major change. Seven out of ten are growing, which in itself is interesting. See more about this in our conclusion below. 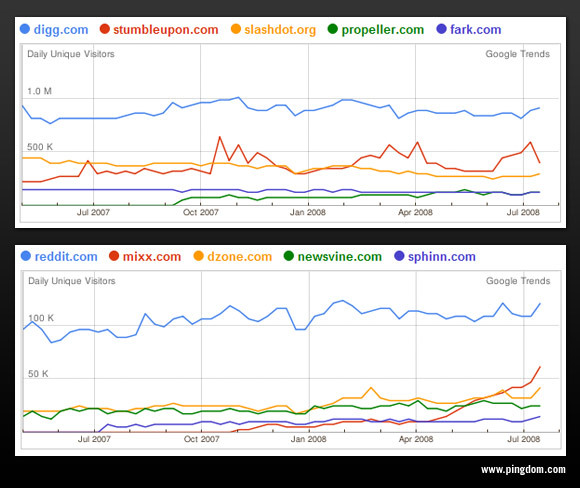 Google Trends allows you to compare the traffic to five websites at a time. Below are graphs for the “top five” and “bottom five” websites in this survey. Digg is still the top dog by a pretty large margin (something we noticed when one of our posts hit the Digg front page the other day), but Mixx is basically making all the other social news sites in this survey look bad when it comes to pure growth rate. If they can keep that up, they have a good chance of becoming one of the largest social networks around. However, they are still relatively small, and the various scaling issues that come with rapid growth and a larger community may hamper their growth rate down the line. Propeller is another site to keep an eye on. They recently passed both Reddit and Fark in traffic. It is interesting to observe that a majority of these websites are experiencing growth. This could indicate that social news as a whole is growing, which is good news for all of these websites. A bigger cake means that even a small slice can contain enough users for a large and healthy community. Considering that there are approximately 1.4 billion Internet users in the world (215 million in the US alone), there should still be plenty of room for growth. The question regarding Digg remains, though. Will anyone be able to usurp them from their standing as the largest social news site within the foreseeable future? This survey is focused entirely on social news sites. By this we mean sites where you submit stories, discuss them, and there is usually some form of voting mechanism to promote popular stories. This means that sites that fall purely under the “social bookmarking” description were omitted from this survey, for example Delicous.com. Some of the included social news sites are more niche than others, for example the developer-centric Dzone.com, or Sphinn.com which focuses on Internet marketing. We tried to include a wide mix of sites. Good article, I’d love to see some of the smaller sites come up and compete with digg. I don’t think any one social site should carry as much weight as digg does. The social landscape shouldn’t be dominated by one major player… It goes against the social media code of ethics, in a sense.. I look forward to a following article talking about Buzz, del.icio.us, twitter (short url’s that get retweeted; or tweeted by someone like Guy Kawasaki), and other social news sites that you haven’t mentioned. I got an idea for you, if your game. Explain which sites are better for E-commerce websites, that would be an invaluable case study, I think the internet marketing community would love. Great article, I was going to add it to digg, when I released that you had reddit as your chosen community. In record of this blog post you may want to change that. Stumbleupon looks very solid, just wondering if they can keep up the pace. Interesting stuff. I guess it is worth watching which sites continue to generate increased traffic based on their varying characteristics.